Who is Greetje den Holder? NFF 2018: What LGBT Movies Can You Watch? 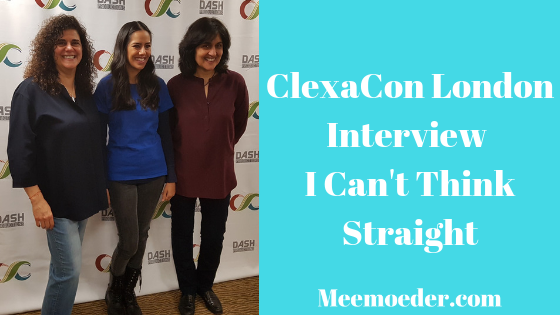 In November, Sheetal Sheth (actor), Shamim Sarif (director), and Hanan Kattan (producer) visited ClexaCon London to celebrate the ten-year anniversary of their movie I Can’t Think Straight. Fortunately, they also came to the press room, so we could ask them some questions about their movies I Can’t Think Straight and The World Unseen, about queer roles, and about future projects. Not the entire fifteen-minute interview is written down below, so if you want to know more, please watch the video below this image. If you had unlimited time and budget, what would you change about I Can’t Think Straight if anything? Shamim: The changes would be subtle: the shot making, the editing, some of the direction. I think that is just part of evolving as an artist. I think you would feel that for a song you have written ten years ago or a novel. So, what I tried to do at the end of that screening [ClexaCon held an anniversary screening of the movie on Friday] was think: “Wow, look at the impact it is having. People get the core of it.” So, I should not be pernickety whether a steady cam would have been nice here or there. But I think it is just having more tools […], that would be fun to experiment with. Hanan: And very expensive [laughs]. Shamim: And very expensive. And often I think time is a pressure for movies. With a bit more time, actors would be able to explore their characters more, there would be more ideas, and we would have been able to shoot scenes that were supposed to be in the film but never made it. That would be great. I think it is time that would be more of a luxury. Sheetal: I think it is the same. For more time, you need more money, so that is usually why you do not have a lot of time. For an actor, it is really about having the space to do your work and generally, in smaller movies, you do not have that much, you know. You have to deliver the moment you get there because of time. I am very proud of the film but of course, if we had more time, we could have maybe expounded something else or explored something else or maybe done a cool shot from a different angle. You know, you can spend a day on a scene, which a lot of movies are afforded to do and you can really find so much in that. On the other hand, there is also something really organic and spontaneous that happens in an environment of small films. I have done so many independent films. If you have the right people involved and the right kind of hearts involved, and everybody knows what to expect when they go there and do not get caught up on the fact that you do not have that stuff, you can really create in a different space, which is also very exciting. Hanan: For me, besides the money factor and time, is to have some pre-sale distribution in place, because it guarantees a wider release. For that to happen, people need to know they can invest the money and know that there is a bigger release. But if you are a first-time or second-time movie, that is not that easy. As queer women, what are your feelings on the importance of having queer actors portraying queer characters? Shamim: It is actually something that has come up more recently for me as we cast our next film Polarized. It gives queer women more opportunity. I think there are two things. Here has been such a taboo in Hollywood for women to come out because it feels it is killing their career as a heterosexual portrayal. So, I think it is nice to share the other side of that. That you can have queer women play queer characters. At the same time, I do not think it should be a limitation. In the same way that I do not think queer women should not play heterosexual characters. On a practical level, sales and distribution, sometimes people want a name. If the only name you can think of is Kristen Stewart and she is busy that moment, there are probably not enough queer actors with enough profile to pre-finance a movie. That is another consideration that people do not want to talk about but it is a reality of making film. Hanan: Whoever suits the role the most. I think it is limiting. It is really the person, do they fit, the chemistry there, can they do it and do it with justice? For me, it is irrelevant as long as they portray the character well. Sheetal [not queer]: I think it is a very tricky thing. First of all, I think the labeling of an actress in any way is the problem. You are not a queer actress: you are an actress who in your personal life is gay. To me, your sexuality should be irrelevant in the sense that you are in your workspace. But I totally understand the idea that if that somehow has become something you are labeled with, and you are not able to get jobs as a heterosexual person in a movie… This whole conversation is like… But this is the world we live in, right? If it is a problem, then, of course, you should be able to have the roles that are written for someone who is gay. But to me, as an actress, I am not interested in playing myself. It is about stretching. There is no point in being an actress if you are only going to do the same thing over and over again. But I do think, as a producer and a content creator, you should just be open to hiring people of all backgrounds, making sure there is a seat at the table for everybody, whatever that may mean. But I do not think that can be the only factor; I think it is a more holistic way of making movies. What does it mean to you personally and to your career to be at an event like ClexaCon London? Sheetal: It is so exciting. I still cannot believe I Can’t Think Straight has been ten years. Obviously, The World Unseen as well. I could never have imagined the impact that these movies have had on so many. You hope for that. You know, you hope that when you make art, that impacts somebody at some point other than yourself. I think to be invited and welcomed in this way is really sweet and lovely. The things that I am hearing from meeting everybody and also being able to meet fans that have been messaging and tweeting me and then finally being able to put a face to a name has been really exciting. And then also hearing what it is. What is the story? Hearing in person what the story is and what it has done and why. Sheetal: What I keep hearing about I Can’t Think Straight is the happy ending, which I did not realize, is so rare in stories having to do with two women. I am like: “Is that true?” And they are like: “Yeah, actually, either someone dies or there are drugs or there is something.” How is that supposed to give anybody hope? I just do not even understand. Honestly, it blew my mind when I kept hearing over and over ‘thank you for this.’ I did not even write the movie. I learn. I am learning a ton. The fact that that seems to be the reality for this type of content is troubling. It is shocking. Hanan: No, it is after I Can’t Think Straight. It is based on us really [points to Shamim, her wife], some fiction. So, it is amazing how it has affected women. Many women have come out as a result of this film in particular. Hanan: Yes. A lot of women have felt more comfortable in their skin. Maybe some have not come out still but they feel better about themselves. That it is okay to have such feelings or to go through this and to come out. So, coming to events like this is very important to continue with spreading the message and reaching more people. Sheetal: And giving it the space and the pedigree that it deserves. You do not want to be in the corner. You absolutely have… Everybody has the right to have their own voice and space heard. And so, for ClexaCon to do that, that is really great for them. As mentioned, this is not the full interview. You can hear more in my video. Do not forget to subscribe to my YouTube channel and share my videos. That really helps with future trips to LGBT+ cons and with me bringing the cons home to people who cannot go to them themselves, for various reasons. It only takes a few seconds to help our beautiful community! Have not watched I Can’t Think Straight yet? You can find the movie on Amazon or in iTunes. PS here are my interviews with Kat Barrell, Natasha, Elise & Annie, Jamie Clayton, Nicole Pacent, Mandahla Rose, the writer and producer of Different for Girls, and the directors of ClexaCon.